Let's Make Macarons ~ I Can Do That! 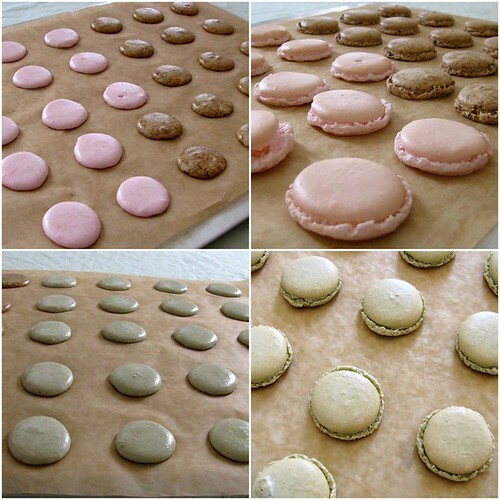 As promised (comments section) here is the macaron tutorial of sorts from the book i ♥ macarons by Hisako Ogita. Making macarons is a seriously involved process but if you are willing to take the time, it's very rewarding to eat tiny puffy buttons. Cut a sheet of parchment paper to fit your baking sheet. Draw 1-inch circles ½ inch apart [use a water bottle cap as a guide]. Cut 2 more sheets of parchment paper but leave unmarked. In a food processor, grind almond flour and powdered sugar together to a fine powder. Sift the mixture throuh a medium-mesh sieve twice. Set aside. 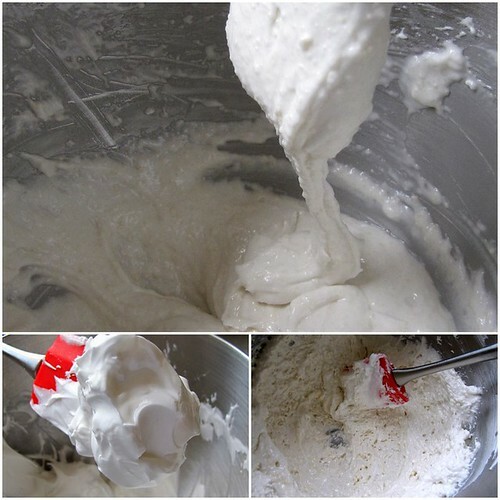 In a standing mixer bowl, beat egg whites on high speed until frothy. Add the sugar 1 tablespoon at a time. Add vanilla and stir lightly. Beat meringue until stiff, firm, and glossy. Add half of the sifted flour. Stir with a spatula while scooping it up from the bottom of the bowl. 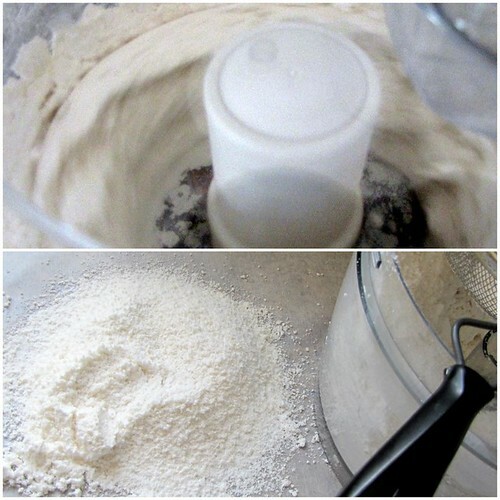 Add the rest of the flour and mix it lightly in a circular motion. Macaronnage: Press and spread out the batter against the bowl's sides. Scoop the batter and turn it upside down (folding method). Repeat 15 times. 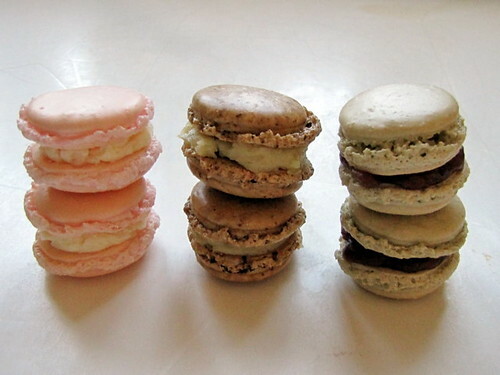 Macaronner: When the batter becomes nicely firm and drips slowly as you scoop it with a spatula, the mixture is done. Fill a disposable pastry bag with the batter and snip a .4-inch opening. Clip the top of the bag to prevent the batter from coming out. Place the parchment with circles on the baking sheet. Place an unmarked parchment on top of the parchment. Pipe the batter using the circles as your guide. When full, carefully remove the parchment underneath. Rap the baking sheet firmly against the counter. 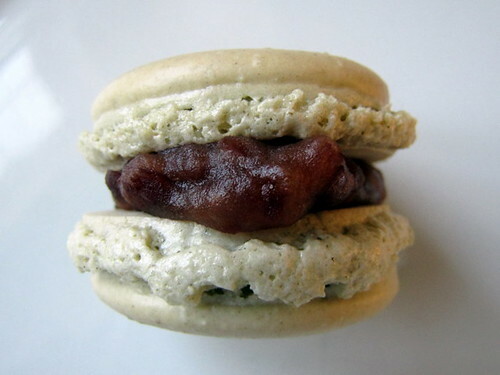 This helps the macarons hold their rounded shape and helps the pied (little feet) to form. Repeat with the next baking sheet, parchment, and piping. You can fold and reuse the marked sheet which will save you time drawing circles. Leave the batter to dry on the kitchen counter for 15 to 30 minutes. Preheat the oven to 375°F. Touch the batter lightly and if they do not stick to your fingers, they are ready. Bake 1 baking sheet at a time for 15 minutes. Remove from the oven and let cool on a wire rack. When completely cool, remove from the baking sheets. Fill with vanilla buttercream. In a small bowl, stir the butter with a spatula until creamy like mayonnaise. In a small pan, boil the water and sugar to soft ball stage. In the bowl of a standing mixer beat the egg lightly. Increase the speed to high and slowly pour the hot syrup. Reduce the speed to medium then to low and continue beating until the bowl has cooled down to the touch. Beat in the creamed butter in three additions. Add a drop or two of vanilla extract. Continue to beat until the mixture is thick and heavy. 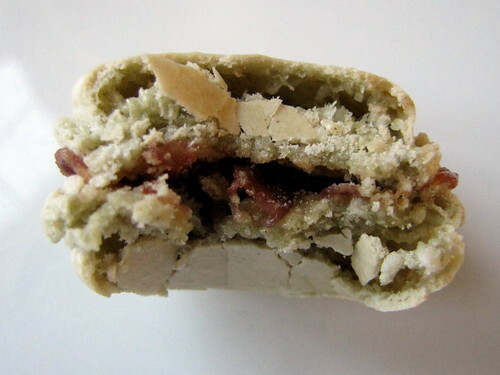 Pipe onto the macaron halves using a disposable pastry bag. Of the 3 or 4 recipes I tried this is the simplest to follow, although at first it looks complicated. i love eating macarons, but making them scares me. the thought of doing anything involving meringue makes me nervous. great job! love to try this soon, thanks for sharing. I made my first macaron today, flavored with matcha. Unfortunately, it did not puff up enough! It was flat. My batter must have been too thick. Maybe next time I should weigh my ingredients instead of measuring them with cups to be more exact. Oggi, I borrowed your photo and, ofcourse, I added a reference to this post. Sometimes I fold the meringue more than 15 times up to 20 to get the right flowing consistency. 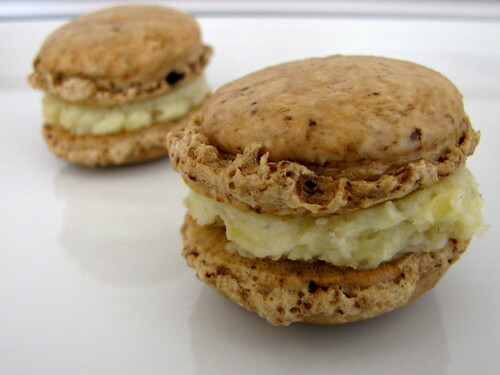 Also, I made Piere Herme's macarons, weighed everything in grams...their "feet" didn't develop as well as these, but the cookies were moist and delicious. I will make another small batch and will post the recipe and method next week.